What’s included: A downloadable ebook with more than 126 recipes and several free bonus guides that provide information on other handcrafted products as well as how to source materials. The guide is available for a one-off payment and comes with the security of a 60-day money back guarantee. As you can download the guide, it is available immediately, wherever you are in the world and without having to wait for delivery. If you have the ingredients you should be able to make your own products within a few hours. Reviews from buyers surveyed were extremely positive. Reviewers were delighted with the wide range of recipes contained in the guide on everything from bath teas, handcrafted soaps, balms, lotions and scrubs. Several people said that the techniques, ideas and recipes in this part of the guide were fantastic value for money and on their own would have been worth purchasing the product. 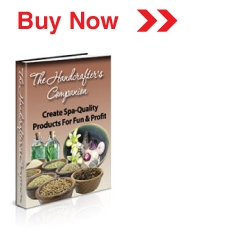 However one of the unexpected benefits people discovered was the importance of labeling and marketing to help you sell the homemade products you are producing. The guide provides an understanding of marketing, branding, labeling and how to create a niche in a very popular consumer section (the fourth largest in the US apparently!). Several people commented on how good the advice was on getting good labels without spending a fortune. They also appreciated that the guide explains how to label products so that they comply with FDA regulations – something I wouldn’t have considered. When you think of products that are a treat you don’t necessarily always think of safety (more on that a little later). One reviewer who loves arts and crafts found after reading the course that she had become quite excited about the idea of selling her handcraft products – something she hadn’t set out to do – and she has started to make niche bathroom products. It’s an interesting concept and the guide certainly seems to offer a lot of advice on how to market handcrafted products successfully. Another reviewer pointed out that even if you don’t want to necessarily make handcrafted soaps and scented products as a sideline, the guide will appeal to you if you like making treats for people as presents and enjoy being surrounded by ribbons, wrappings and bows. As mentioned, the guide considers the safety aspect of the products. While it would be easy to think of oils and herbs as being quite harmless, there are actually safety questions to bear in mind. Pregnant women or those suffering from high blood pressure should avoid some substances. Several reviewers were very grateful for the guidance that the author provides. When creating something handcrafted the last thing you want is to cause harm to anyone! In conclusion, a good value option vs. other products currently on the market… You can learn more about what the product has to offer here. You get the product, along with three bonus offers, from the official supplier by clicking the box to the right – buying here will entitle you to the full money-back guarantee plus email support. Alternatively, if you have any questions or feedback of your own about this product, please use the comment thread below.